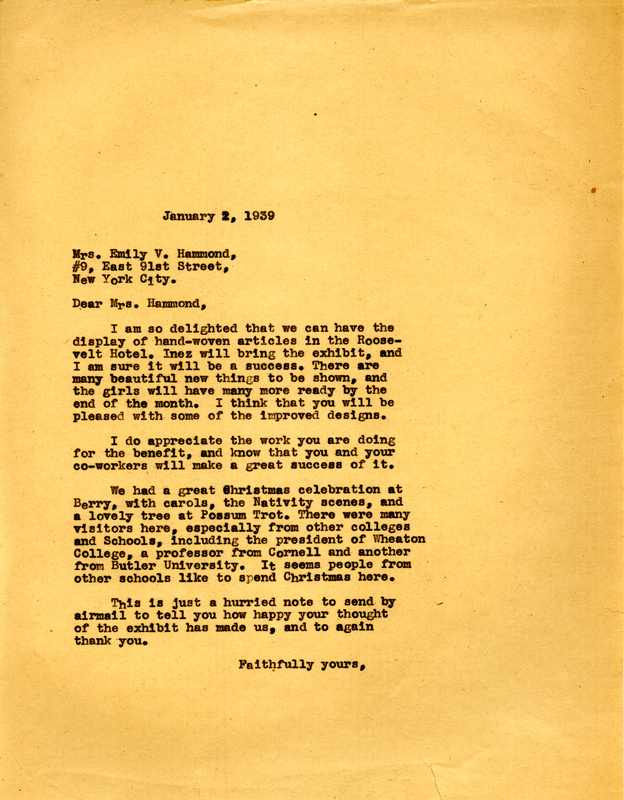 In this letter Martha Berry tells EVH that she is excited to have the handwoven articles in the exhibit at the Roosevelt Hotel. She also tells her that there were many visitors to the college over the Christmas season. Martha Berry, “Letter to Emily Vanderbilt Hammond from Martha Berry.” Martha Berry Digital Archive. Eds. Schlitz, Stephanie A., Jordan Brannen, Jessica Hornbuckle, et al. Mount Berry: Berry College, 2016. accessed April 26, 2019, https://mbda.berry.edu/items/show/15072.